For all your pumping needs! 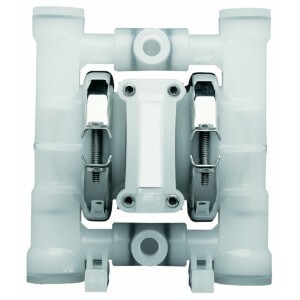 Barish Pump Company offers a broad range of air operated double diaphragm pumps. 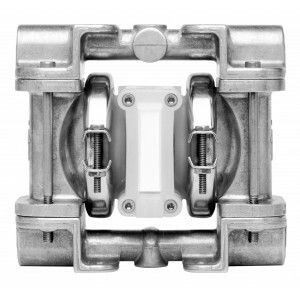 Our air operated double-diaphragm pumps feature flow rates from 0-300 GPM, and are manufactured in a variety of materials ranging from Stainless Steel to Polypropylene (a variety of materials including stainless steel and polypropylene). We offer a range of pumps from Wilden. In 1955, a man named Jim “Slim” Wilden invented the air-operated double-diaphragm (AODD) pump. Since then, the name “Wilden” has been synonymous with excellence. Wilden pumps are designed to handle tough jobs like pumping slurry, concrete or barrels of water. They can be used for a range of industrial applications, from oil & gas to pharmaceutical. Our catalog features Wilden pumps ranging in sizes from ¼” to 4”. Item: P25/KZPPP/TNL/TF/KTVSize: 1/4"Materials: PVDF/NO OUTER PISTONElastomer: PTFE W/NEOPRENE BACK-UP O-RING, IPDRecommended Kit:ADS Repair Kit: 15-9988-99ADS Kit Description: KIT, AIR, PX/3"-4"/C/M/.. Item: P25/PZPPP/TNL/TF/PTV/0014Size: 1/4"Materials: POLYPROPYLENE/NO OUTER PISTONElastomer: PTFE W/NEOPRENE BACK-UP O-RING, IPDRecommended Kit:ADS Repair Kit: 02-9985-20ADS Kit Description: KIT, AIR,.. Item: P25/KZPPP/TNL/TF/KTV/0014Size: 1/4"Materials: PVDF/NO OUTER PISTONElastomer: PTFE W/NEOPRENE BACK-UP O-RING, IPDRecommended Kit:ADS Repair Kit: 04-9988-99ADS Kit Description: KIT, AIR, PX/1.5"-.. Item: P25/PZPPP/TNL/TF/PTV/0671Size: 1/4"Materials: POLYPROPYLENE/NO OUTER PISTONElastomer: PTFE W/NEOPRENE BACK-UP O-RING, IPDRecommended Kit:ADS Repair Kit: 02-9988-99ADS Kit Description: KIT, AIR,.. Item: P25/PZPPP/TNL/TF/PTV/0677Size: 1/4"Materials: POLYPROPYLENE/NO OUTER PISTONElastomer: PTFE W/NEOPRENE BACK-UP O-RING, IPDRecommended Kit:ADS Repair Kit: 04-9980-07ADS Kit Description: KIT, AIR,.. Item: A25B/KZPPP/TNL/TF/KTV/0512Size: 1/4"Materials: PVDF/NO OUTER PISTONElastomer: PTFE W/NEOPRENE BACK-UP O-RING, IPDRecommended Kit:ADS Repair Kit: 02-9985-20ADS Kit Description: KIT, AIR, P/1"/C/.. Item: A25B/PZPPP/TNL/TF/PTV/0512Size: 1/4"Materials: POLYPROPYLENE/NO OUTER PISTONElastomer: PTFE W/NEOPRENE BACK-UP O-RING, IPDRecommended Kit:ADS Repair Kit: 04-9985-20ADS Kit Description: KIT, AIR.. Item: A25P/PZPPP/TNL/TF/PTV/0151Size: 1/4"Materials: POLYPROPYLENE/NO OUTER PISTONElastomer: PTFE W/NEOPRENE BACK-UP O-RING, IPDRecommended Kit:ADS Repair Kit: 04-9988-20ADS Kit Description: KIT, AIR.. Item: A25P/PZPPP/TNL/TF/PTV/0150Size: 1/4"Materials: POLYPROPYLENE/NO OUTER PISTONElastomer: PTFE W/NEOPRENE BACK-UP O-RING, IPDRecommended Kit:ADS Repair Kit: 04-9985-20ADS Kit Description: KIT, AIR.. Item: P25/PZPPP/TNL/TF/PTV/0678Size: 1/4"Materials: POLYPROPYLENE/NO OUTER PISTONElastomer: PTFE W/NEOPRENE BACK-UP O-RING, IPDRecommended Kit:ADS Repair Kit: 15-9993-99ADS Kit Description: KIT, AIR,.. Item: P25/PZPPP/TNL/TF/PTV/0502Size: 1/4"Materials: POLYPROPYLENE/NO OUTER PISTONElastomer: PTFE W/NEOPRENE BACK-UP O-RING, IPDRecommended Kit:ADS Repair Kit: 15-9986-20ADS Kit Description: KIT, AIR,.. Item: A25B/PZPPP/TNL/TF/PTV/0501Size: 1/4"Materials: POLYPROPYLENE/NO OUTER PISTONElastomer: PTFE W/NEOPRENE BACK-UP O-RING, IPDRecommended Kit:ADS Repair Kit: 04-9993-99ADS Kit Description: KIT, AIR.. Item: A25P/KZPPP/TNL/TF/KTV/0151Size: 1/4"Materials: PVDF/NO OUTER PISTONElastomer: PTFE W/NEOPRENE BACK-UP O-RING, IPDRecommended Kit:ADS Repair Kit: 02-9985-20ADS Kit Description: KIT, AIR, P/1"/C/.. Item: P25/KZPPP/TEL/TF/KTVSize: 1/4"Materials: PVDF/NO OUTER PISTONElastomer: PTFE W/EPDM BACK-UP O-RINGRecommended Kit:ADS Repair Kit: 02-9985-20ADS Kit Description: KIT, AIR, P/1"/C/C/PWetted Path .. Item: A.025P/KKPPP/WFS/TF/KWF/0150Size: 1/4"Materials: PVDF/PVDFElastomer: WIL-FLEXRecommended Kit:ADS Repair Kit: NAK ADS Kit Description: No Air Kits Offered For Accu-Flo PumpsWetted Path Kit: NWK .. Item: A25P/PZPPP/TNL/TF/PTV/0676Size: 1/4"Materials: POLYPROPYLENE/NO OUTER PISTONElastomer: PTFE W/NEOPRENE BACK-UP O-RING, IPDRecommended Kit:ADS Repair Kit: 04-9988-99ADS Kit Description: KIT, AIR.. Item: P.025/KZPPP/TNL/TF/KTV/0310Size: 1/4"Materials: PVDF/NO OUTER PISTONElastomer: PTFE W/NEOPRENE BACK-UP O-RING, IPDRecommended Kit:ADS Repair Kit: 15-9988-99ADS Kit Description: KIT, AIR, PX/3"-.. Item: P.025/PZPPP/TNL/TF/PTV/0310Size: 1/4"Materials: POLYPROPYLENE/NO OUTER PISTONElastomer: PTFE W/NEOPRENE BACK-UP O-RING, IPDRecommended Kit:ADS Repair Kit: 04-9988-11ADS Kit Description: KIT, AI.. Item: XP.025/AZPPP/TEL/TF/ATFSize: 1/4"Materials: ALUMINUM/NO OUTER PISTON Elastomer: PTFE W/EPDM BACK-UP O-RINGRecommended Kit:ADS Repair Kit: 02-9985-20ADS Kit Description: KIT, AIR, P/1"/C/C/PWett.. Item: A25P/KZPPP/TNL/TF/KTV/0150Size: 1/4"Materials: PVDF/NO OUTER PISTONElastomer: PTFE W/NEOPRENE BACK-UP O-RING, IPDRecommended Kit:ADS Repair Kit: 04-9985-20ADS Kit Description: KIT, AIR, P/1.5"-.. Copyright © 2016 Barish Pump Company. All rights reserved.